My chili lunch turned out fabulous, and I had a second bowl around 8 O’Clock before going out tonight. Ohh, if you’re wondering about how alcohol figures into this ridiculous diet, allow me to explain now. On the carb-slow diet, you are allowed to have 2 glasses of red wine each night, and the drier the red wine the better (so Pinot Noirs, Cabernets, and Merlots over Malbecs, for example). But I don’t feel the need to drink every night, and so I have taken it upon myself to justify roll-over drinks. Meaning that on the nights I do drink, I will allow myself to have 3 because I had none the previous night. This is probably not allowed, but I am in college and there are nights that I will want to be drunk with friends, so I’ve decided to bend the rules a little bit. Also, I find myself getting drunk off of only 3 glasses of wine now because there isn’t a whole bunch of carbs in your belly to absorb the alcohol. That’s definitely a perk on this diet—you become a lightweight that gets drunk fast and for cheap. Certainly is saving me money at the bar! Anyways, tonight I went with some friends to the Setai for drinks and a bite to eat before going out to LIV. This was my first time eating out on the diet, and it was probably the most conducive menu to my limitations. The Restaurant at the Setai is a Pan-Asian, Pacific Rim restaurant with infusions of Indian, Thai, Chinese, and Malaysian cuisines. So it is a lot of protein and a lot of vegetables, which I can have. 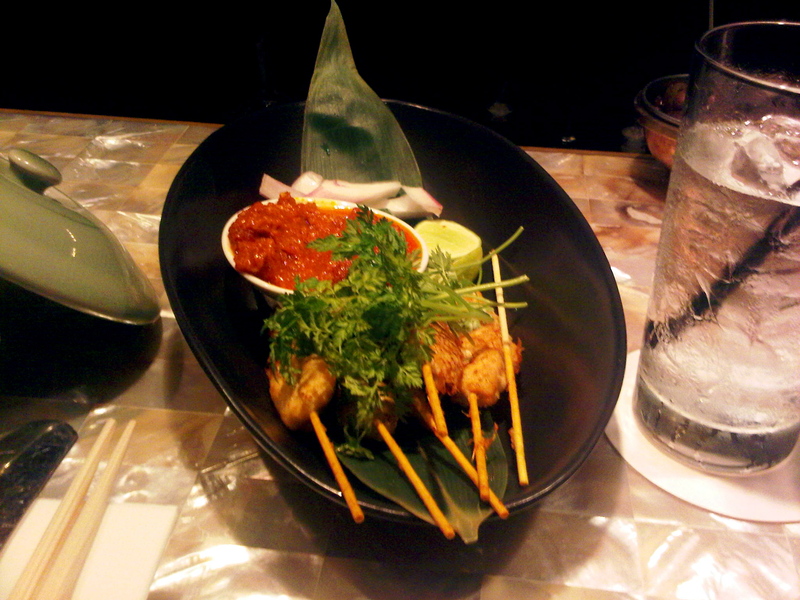 To start I ordered the Chicken Satay Skewers, which came with a spicy red dipping sauce. They were delicious, but certainly different because they didn’t come with the traditional peanut sauce. I also ordered the Tom Kha Gai Soup, which is chicken, galangal, kaffir lime leaf, and oyster mushrooms, simmered in coconut milk. This dish is one of my favorites, and I always order it when I go out for Thai food, so it was hard for me to deny myself the coconut milk broth and sticky rice that I normally put it in. Instead, I used my chopsticks to pull out the pieces of meat and the different veggies, leaving behind the delicious, but caloric, coconut milk and rice. The dish was still fabulous though and the chicken was so well flavored from cooking in the broth. 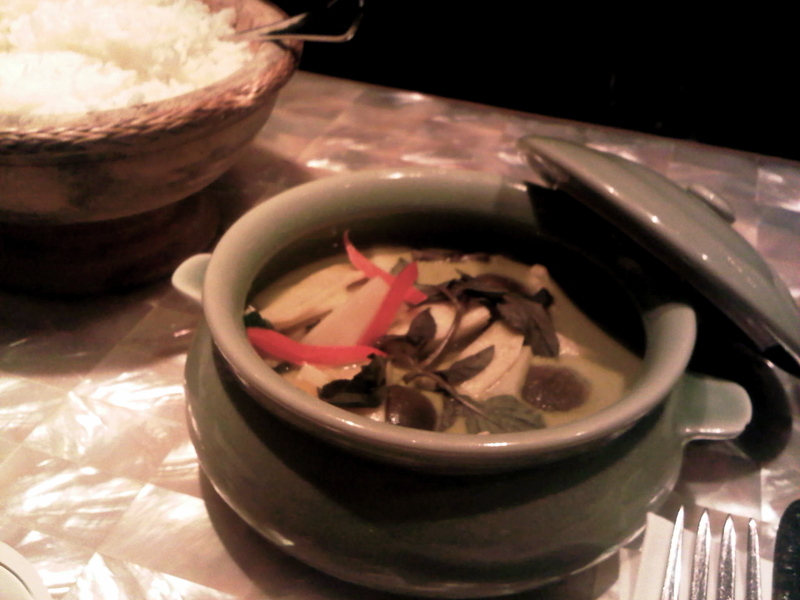 It probably would have been the best Tom Kha Gai I have ever had, had I been allowed to drink the broth and eat the rice. But it was still fabulous! I did make one little splurge tonight and substituted one glass of wine for a Chili Passion Martini, which is officially the best cocktail that I have ever tasted! 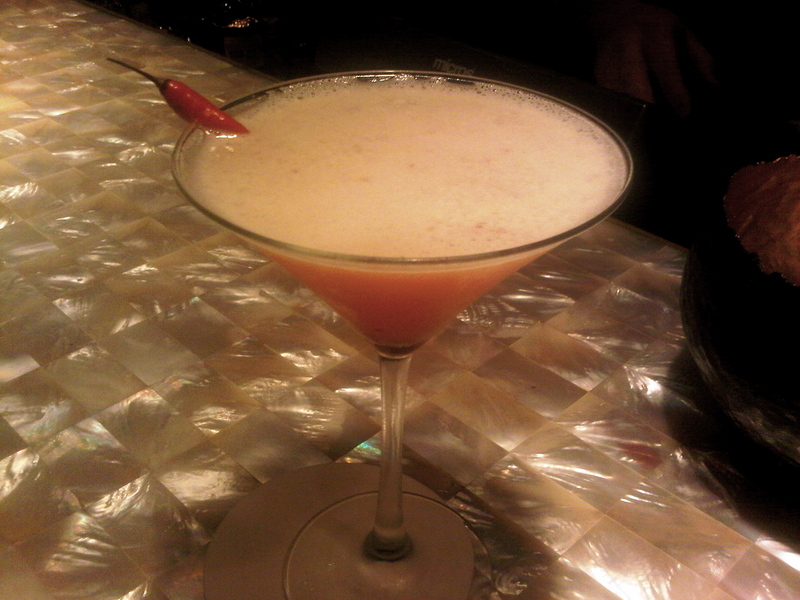 It is Captain Morgan Passion Fruit Infused Rum, Ginger Juice, Orange Juice, Cranberry Juice, and Red Chili Seeds. WOW! It is such an exotic flavor with a perfect blend of hot and sweet. I will probably have cravings for this drink in the near future. If you go to the Setai, you must order this martini! End of story. I now it sounds super girly—and it is—but boys, order one for the girl that you are with and steal a sip or two. I promise that it is so good, you won’t care what anyone thinks of you sipping your passion martini (decorated with a cute little red chili pepper!). all the food looks so amazing and is making me so hungry p.s I am coming back to Miami soon! Ohhh… Boy! Why can’t we get exotic drinks like this in the grey, cold northeast??? Maybe we would all be a little happier?